Help young children understand how to become more peaceful and tolerant by learning about the 6 pillars of peaceful character (respect, caring, fairness, responsibility, trustworthiness, citizenship). 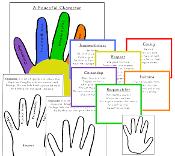 Using the hand as an example makes this lesson easier for children to remember. This material is very open-ended and can be used with a variety of ages in a large variety of creative ways. This item is available for FREE but can not be downloaded through the shopping cart.